With wind and solar resources that complement each other exceptionally well, is the state ready to reimagine its power grid? The astounding growth in wind and solar power coupled with their plummeting prices means that we are now radically rethinking how we produce, transmit, and sell power. Customerswant 100 percent renewable energy, states want to cut their greenhouse gas emissions, and utilities are scrambling to come up with new business models and infrastructure to accommodate them. The wind and the sun are some of the most abundant sources of energy in the world, and they’re free. But the big challenge of harnessing them is the simple fact of their intermittent availability: In general, the sun shines during the day, which means the amount of solar energy available is highest during the day. Wind, meanwhile, is usually strongest at night, so wind energy peaks after sunset. Given this difference, one source could — in theory — compensate for the other’s lulls. But in practice, few places in America have enough sunlight and wind to balance each other out. One place that happens to have plenty of both? Texas. Researchers at Rice University recently mapped out the Lone Star State’s breezes and sunshine to assess what they called “complementarity,” how the energy available from one energy source rises and falls in relation to another. If a wind turbine farm’s highs occur as a solar array’s output bottoms out and vice versa, the generators are said to have high complementarity. By making power output more consistent, complementarity makes the grid more reliable, easier to schedule power, and cheaper. What the Rice team found is that patterns of wind and sunshine in Texas complement each other exceedingly well, helping the grid provide enough power even at moments when electricity demand is highest, like during the searing summer heat when hundreds of thousands of air conditioners are switched on. “The more complementarity you’ll have, the less you’ll need other expensive stuff,” said Daniel Cohan, an associate professor of environmental engineering at Rice and an author of the study published in November in the journal Renewables: Wind, Water, and Solar. That expensive stuff includes backup generators, energy storage, and power electronics. To be clear, the findings don’t show that Texas could pull off a 100 percent renewable energy grid just yet. But they do show that renewables could replace a whole lot of dirty energy without breaking much of a sweat. Though coal is increasingly being priced out of the market, it still provides about one-thirdof the state’s electricity. Wind provides roughly 17 percent, and solar barely registers. So renewables still have plenty of ground to gain, and the state is uniquely positioned to balance out its grid with the wind and solar resources it has. Is Texas ready for this kind of drastic reimagining of the power grid? Probably not just yet. For now, the conventional wisdom that wind and solar are too unreliable continues to permeate planning discussions. Let’s break it down. Texas is a pretty unique case in the United States. It’s the country’s largest oil producer. It’s the largest lignite coal producer. It’s the largest natural gas producer. At the same time, it’s the largest wind energy producer in the country and retired a record 4.2 gigawatts of coal capacity in 2018. And unlike other states, Texas has its own internal competitive power market, the Electric Reliability Council of Texas, or ERCOT, which provides about 90 percent of the state’s power. That gives Texas a bit more room to experiment than other regions. In 2005, the state legislature passed a law signed by then-Gov. Rick Perry (now energy secretary), requiring that it increase its use of renewable energy. 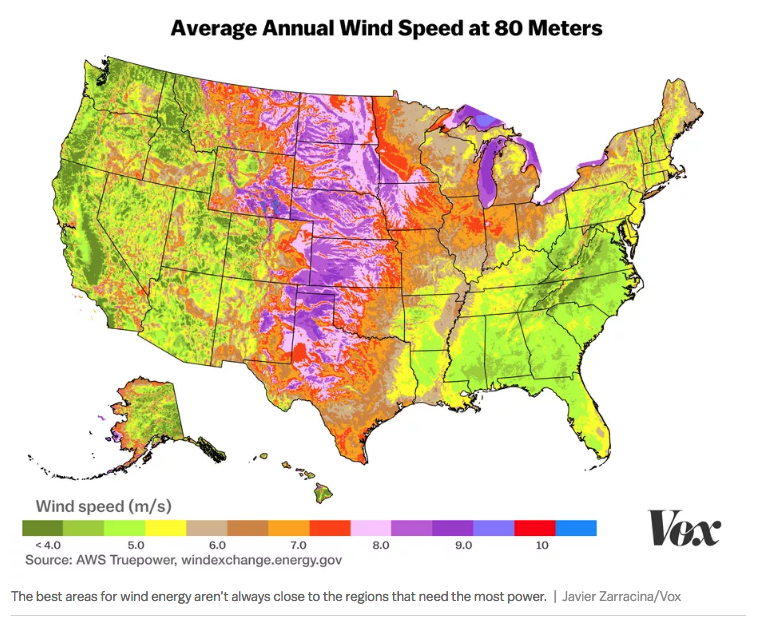 The problem was that some of the best sites for wind turbines — with the most consistent and highest speeds — are in the western part of the state. The massive, power-hungry cities like Houston and Dallas are in the east. So the state needed a way to shuffle electrons from where they’re cheapest and most abundant to where they’re wanted, and it needed a way to pay for it. The Public Utility Commission of Texas decided to create regions designated as Competitive Renewable Energy Zones to bridge that gap. It led to the construction of more than 2,300 miles of transmission lines at a cost of nearly $7 billion. This buildout helped make Texas the king of wind in the United States while still maintaining some of the lowest electricity prices in the country. With more coal plants going offline in Texas due to competition from natural gas, Cohan wanted to see if Texas could build on its experience with a statewide renewable energy network. Cohan looked at the wind and sunlight available throughout the year across 12 sites in Texas. A key thing to remember is that renewables vary not just throughout the day, but throughout the year. Sometimes regions can at times face “wind droughts” that last for months, and there’s less daylight in the winter than in the summer. Cohan found that not only do solar and wind energy complement each other over the course of the day in Texas, different wind energy sites can step in for one another throughout the year. Coastal winds in Texas are strongest in summer afternoons while the winds in west Texas are stiffest during the shoulder seasons — spring and fall — and at night. What it means is that a network of wind and solar generators distributed throughout Texas can provide a remarkably steady stream of electricity with their powers combined, and that increasing renewable energy capacity can actually enhance grid stability. It’s a feat that other states would have a harder time pulling off. Arizona gets 40 percent of its electricity from the sun. Iowa gets 37 percent of its electricity from wind. But Arizona isn’t exactly famous for its breezes and few people are going to Iowa to get a tan. Demand profiles are different in other states too. States in the northeast like Massachusetts can see major demand spikes when solar output is low, like in the winter as temperatures drop and people spend more time indoors with heaters. And complementary renewables aren’t a perfect drop-in replacement for coal either. Christopher Clack, a grid researcher and CEO of Vibrant Clean Energy who was not involved in the study, said the US grid can accommodate vastly more renewable energy by distributing generators, building out more robust transmission networks, and taking advantage of complementarity. But when reaching about 80 percent penetration of renewables, some of the quirks that come with intermittent sunlight and wind become much more difficult to reconcile with how we use energy. And even at a lower share of the power mix, there are still some gaps between the times when solar panels and wind turbines produce electricity. “The difficulty is the transition periods (early morning and post-sunset) [where] there are physical reasons why wind and solar in these timeframes are harder to get anti-correlations emerging regularly,” Clack said in an email. That means utilities will still need some kind of reserve power, though likely not at the immense scales usually assumed to be needed with renewables. “Long-story-short, wind and solar have been know to be great complements to each other for a long time … but it only does so far — and doesn’t hold true everywhere in a radius that is helpful for pairing,” Clack said. Texas is on track to decommission more coal and even some older natural gas power plants in 2019. And the state is facing down a summer demand season with a historically low power reserve margin of 8.1 percent, leaving little room for error. That means the market is hungry for new power generation. A 2015 report from the Brattle Group for the Advanced Energy Economy Institute found that ERCOT could feasibly integrate upward of 50 percent renewable energy using existing technology “with modest operational changes.” Yet energy prices also remain low, making the economics of building new power plants more difficult, especially for more renewable energy and transmission along the lines of the CREZ buildout. “There isn’t the political appetite right now to do that again,” Cohan said. With the power sector in flux, utility commissioners have an opportunity to rethink the grid as it stands. As my Vox colleague David Roberts explained at length, the top-down power generation model is becoming increasingly obsolete, as we’re seeing in Texas. It’s already nearly impossible to finance a new big, centralized coal power plant, and it’s getting harder just to keep current ones running. Renewables, with their lower cost of entry, are cropping up on rooftops and in cooperatives as cities and regions take their power generation into their own hands. The city of Georgetown, Texas, is already powered by 100 percent renewable energy from wind and solar power. Utilities, however, are notoriously stodgy, and institutional hurdles — like financing, regulations not designed to govern renewables, and simply aversion to the risk of trying something new — still stand in the way of building a grid that can accommodate more clean energy. There are major technical challenges too, like switching from a few dozen central power plants to networking thousands of rooftop solar arrays and wind farms to deliver power that’s both reliable and affordable. But Cohan’s study shows that it’s not as difficult as we once thought.